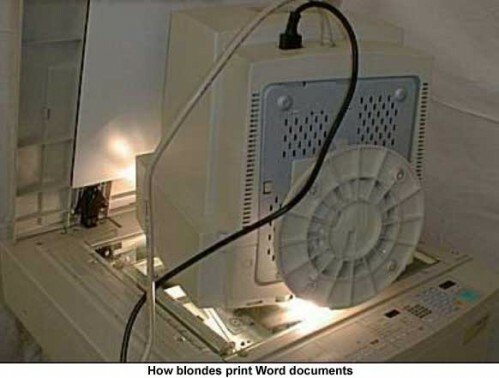 How blonds print Word documents. New rule. Next person that post that person deserves their nuts to be put in a vice & shut closed! And I hope I didn’t just walk into a bad joke. This reminds me of my last job where I was working with people from another company and I asked them to send me a screenshot of whatever bug they were experiencing. Instead of a screenshot, they took a picture of the screen and then sent me that picture. Someone really got to update this image using modern plasma-monitor. This one is as old as teh internets. On the plus side, you have no external genitalia to be mutilated, so you have that going for you. Damnit! I knew I should have kept my fingers away from the keyboard. @nyokki: laughed quietly to myself. I dont know what that lunatic was talking about.